How to remove/delete email sent to wrong user(s) using Search-mailbox cmdlet | Chinny Chukwudozie, Cloud Solutions. I recently came by a situation where confidential email was mistakenly sent to the wrong users. I was asked to find a way to delete the email. I knew I could use the Search-mailbox cmdlet since this is an Exchange 2010 deployment, but totally forgot I had to configure a Role assignment before this could work. 1) First I had to identify the Exchange management role that’s required to import, export or delete content from a mailbox. This would be the Mailbox Import Export Role. Running this cmdlet the first time, I realized the DeleteContent Parameter was missing. Assigning the role to this user will enable permissions for the DeleteContent parameter for the Search-Mailbox cmdlet. The result of this command informs me the email item is present in the source mailbox. I went ahead and used the DeleteContent parameter to remove/delete the email. DeleteContent is a switch parameter and therefore does not need a value. 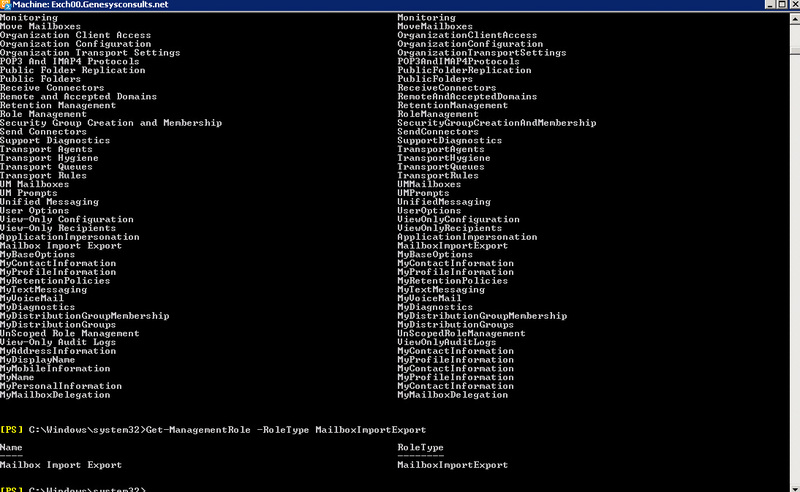 [PS] C:\>$users = Get-DistributionGroupMember -Identity "Accounting"
This entry was posted in Exchange 2010 SP2, Exchange Cmdlets, Exchange Management Shell, PowerShell. Bookmark the permalink.